Now Available from Chronicle Books! 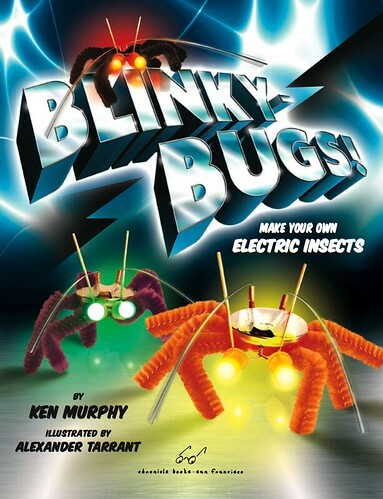 I'm happy to announce that I have a new Blinkybug Book available in stores and online. This book comes with all the parts you need to make your own blinking, electronic insects, along with beautifully illustrated instructions in a comic-book format. Blinkybugs are simple, electro-mechanical insects that respond to their environment by blinking their L.E.D. eyes. The original Blinkybug Kits are currently available online at Make Magazine's Maker Shed. Interested in bulk pricing for your workshop event? Contact me. Download bug-building instructions for the original (boxed) Blinkybug kit: version 1 and version 2. Sign up for the Blinkybug-Announce email newsletter to find out about new kits. No Spam! You can also join the Blinkybug Facebook Page. LED Art Kits are also available at the MakerShed. The instructions are also available as an Instructable.